As a college preparatory school, Archbishop Williams High School provides a comprehensive program of intellectual, aesthetic, and physical activities that stems from the school’s Mission Statement, our beliefs about teaching and learning, and the various needs of our students. All levels prepare students to attend a four-year post-secondary educational college or university. The most rigorous curriculum is the Advanced Placement/Honors program. Highly selective, it is designed to prepare students for academic success in the most competitive colleges and universities. The AWHS faculty consists of caring, highly qualified professionals, the majority of whom possesses a Master’s Degree and/or Massachusetts Certification in their field of teaching. Our teachers use various teaching styles that address the auditory, visual, and kinesthetic learning needs of students in classroom activities and homework assignments. Classroom instruction is enhanced by the use of state-of-the-art technology such as Smartboards, as well as discipline-specific technology such as Vernier LabPro/TI 84 for collection of data and data analysis in mathematics and science. A variety of electives are offered for juniors and seniors, including hundreds of on-line courses through the Virtual High School (www.govhs.org). 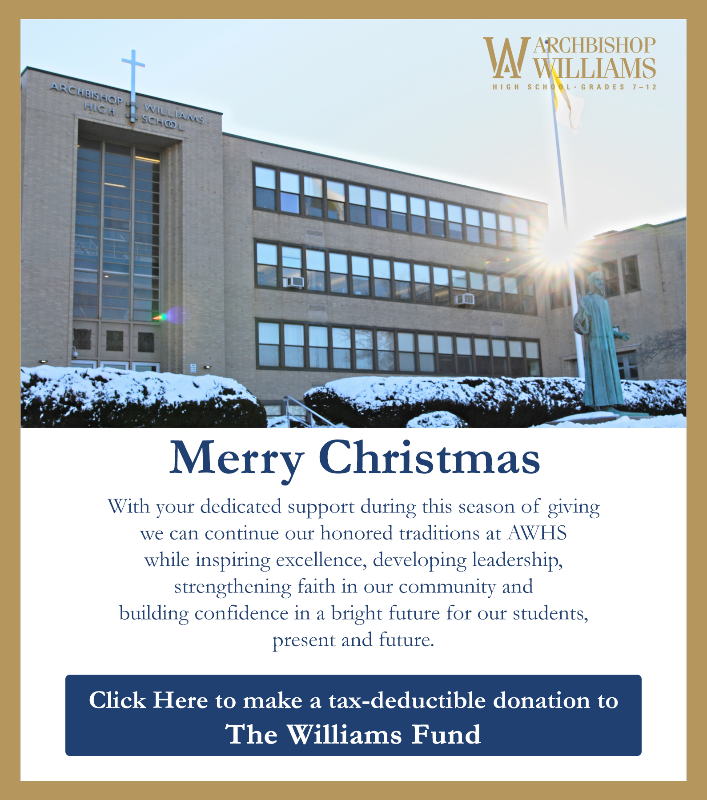 The strong academic program and the quality of teaching, embedded in a caring, nurturing, Christian environment, allows Archbishop Williams to be true to its mission “…to graduate capable and confident young people who are responsible members of their communities and who are guided by the values of the Catholic Church." This is evidenced by the ongoing success of Archbishop Williams Alumni. For course descriptions and requirements, click to view the Program of Studies.